A storm system known as a ‘bomb cyclone’ is slowly churning through the US interior for the second time in a month, unleashing a blizzard in parts of the Midwest while creating hazardous fire conditions farther south. On Thursday morning, some 13,200 homes were without power in Minnesota and 12,600 homes in South Dakota. More than 180 flights were cancelled at Denver International and 170 flights at Minneapolis-St Paul International. Residents throughout the north-central United States could expect downed trees, widespread power outages, road closures and treacherous driving conditions through Friday, the NWS said. Schools in Minneapolis and St. Paul were among hundreds that closed in Minnesota, where as much as two feet of snow is expected by Friday. 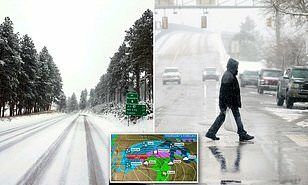 Both this storm and the one several weeks ago qualified as a ‘bomb cyclone,’ a weather phenomenon that entails a rapid drop in air pressure and a storm strengthening explosively, according to David Roth, a forecaster at the National Weather Service’s Weather Prediction Center in Maryland. Bomb cyclones are defined as a drop in atmospheric pressure of 24 millibars in 24 hours. The latest storm’s impacts are likely to be similar to last month’s, Roth said. That blast dropped heavy snow and led to massive flooding in the Midwest that caused billions of dollars in damage in Nebraska, Missouri, Iowa and South Dakota. Hopefully this time it will be a slow snowmelt,’ Roth said. Particularly hard hit by the storm were eastern South Dakota and southwestern Minnesota. Winds in excess of 50mph were expected, creating life-threatening conditions, according to the National Weather Service. ‘We’re calling it historic because of the widespread heavy snow. We will set some records,’ said Mike Connelly, a weather service meteorologist in Aberdeen, South Dakota. In Colorado, officials closed a 150-mile stretch of Interstate 76 from just northeast of Denver to the Nebraska border, and Governor Jared Polis activated the National Guard in case troops are needed to rescue stranded motorists. Denver Public Schools announced delayed starts Thursday for some campuses due to weather. In Nebraska, the State Patrol sent additional troopers into the state’s panhandle, and officials closed Interstate 80 in that region. ‘This storm is going to be dangerous,’ Patrol Maj. Russ Stanczyk said. An unusual but not rare weather phenomenon known as ‘thunder snow’ – snow accompanied by thunder and lightning – was reported in central South Dakota. ‘It’s essentially a thunderstorm, but it’s cold enough for snow,’ Connelly said. Nebraska Governor Pete Ricketts extended five weather-related executive orders until May 15 to help communities gain fast access to the state’s emergency resources. Minnesota Governor Tim Walz said ‘the National Guard stands ready’ to rescue any stranded motorists. The weather service posted an ice storm warning into Friday morning for a portion of southern Minnesota, noting that thick ice could accumulate on power lines and lead to outages. The weather service issued a high wind warning for the Texas and Oklahoma panhandles. Winds in excess of 50mph were combining with low humidity and an unstable atmosphere to create critical fire conditions in the three states. Forecasters in New Mexico said the winds also would make travel difficult on north-south oriented roads, such as Interstate 25. In southern New Mexico, the US Army’s White Sands Missile Range closed Wednesday because of the winds. Forecasters said this week’s storm will swell rivers again, though likely not to the levels seen last month due to the absence of a wet snowpack on frozen ground. But even moderate rises in the Missouri River will push more water into drenched Fremont County in southwestern Iowa, Emergency Manager Mike Crecelius said. Last month’s flooding swamped 455 houses and thousands of acres of farmland in his region. ‘The problem is that we’re not getting any time for the water to recede and things to dry out, so the levees can’t be fixed; houses can’t be fixed; crops can’t be planted,’ he said.